I have always been fascinated by those tall, spindly, almost cactus-like trees with spikey leaves that seem to thrive on Pacific-rim beaches. Those of you who have visited south-east Asia or the Pacific Islands will know what I mean. 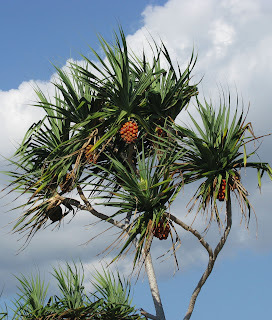 The Pandanus genus contains approximately 600 species and they can grow up to 20 metres in height. 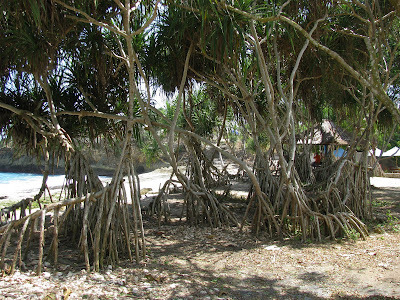 Typical beach-side Pandanus tectorius trees on Nusa Lembongan. 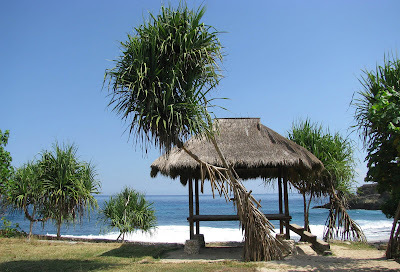 In Nusa Lembongan, the local Pandanus (p. tectorius)species seems to very much enjoy the beach-side sandy soil and is certainly tolerant of salt spray from the ocean. There is something almost primeval about the way this tree clings to the earth and spreads its spikey canopy. The habit of dropping prop roots from existing branches has resulted in the locals calling this the walking tree. It certainly does sometimes look as if the trees are indeed 'walking'. 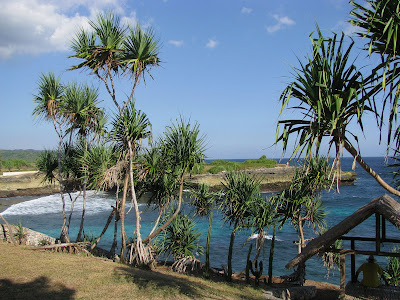 Pandanus makes for a spectacular beach-side flora around the island but especially in the south-western quarter. There are excellent examples in the Devil's Tear, Dream Beach and Sunset Beach areas. The owners of recently completed villas here have tried wherever possible to keep the Pandanus trees - they really do make for a superb component of a landscaped garden on a tropical island. As well as their form, Pandanus trees can be appreciated for the beauty of their reddish orange fruit. I do not know of any human uses of the fruit or flowers but they are an attractive component of the tree and seem to be popular with fruit bats and squirrels. Thoughout Asia and the Pacific islands, the leaves of Pandanus species are widely used for weaving traditional mats and other products. The leaf extract from one particular species (now widely cultivated) is also used as an aromatic flavouring in both savoury and sweet cooking. So when you visit Nusa Lembongan, take a few moments to appreciate those wonderful, primeval trees. And perhaps Mr Tolkien was right about Ents after all? That was very enjoyable reading. Is the fruit seasonal or year 'round? I've never seen Pandanus trees before, they are indeed beautiful and so unusual! Thank you very much for the comments. Sandcastles, the fruiting seems to independent of season. I operate www.onetravel.wordpress.com and I would love to have you on as a guest. Please let me know if you're interested. The purpose of this blog is to publish just about anything about the island of Nusa Lembongan in Bali, Indonesia. It could be news, reviews, travel tips, travel guide information, write-ups of experiences from the world class diving and surfing sites on this tropical island paradise.... let's see where it takes us. Scoot Scoot Lembongan Island Fast Cruises. 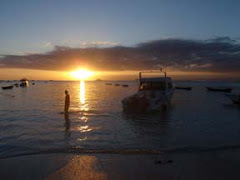 Blue Water Safaris Speed Boat to Lembongan plus Sport-Fishing and Ocean adventures. New and Rambles from Nusa Lembongan by http://nusalembongannews.blogspot.com/ is licensed under a Creative Commons Attribution-No Derivative Works 3.0 Unported License. Based on a work at nusalembongannews.blogspot.com.